With the snapper spreading out to varying depths, the 28-30 metre mark has seen good catches of healthy, tasty school snapper taken. 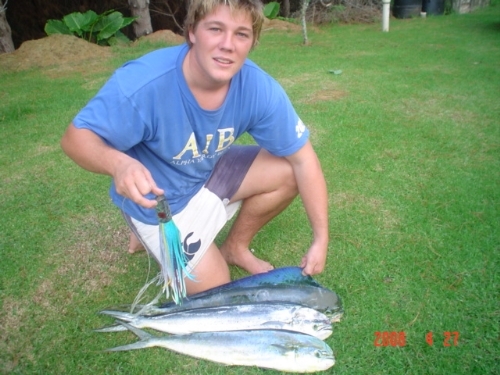 There has been a bycatch of some nice trevally with the odd gurnard thrown in along with the usual quantities of kahawai there as well. The 60-63 metre mark has also seen quick bin ups during the evening bite time too. Raglan harbour is also fishing well with hungry small snapper to be caught in the right places at the right times on a consistent basis. The kingfish have been plentiful on the local structures with a couples of nice keepers in the bin after only minutes of vertical jigging, which makes a great start to a trip before bottom fishing commences. With Raglan's first marlin caught around the hundred meter mark recently, the next patch of settled weather looks sure to produce again. Skipjack tuna have also been caught around 50-60 meter mark on the way to Gannet Island.